Welcome to the 1st episode of GlitterMania reviews! Past year, my passion for nail polishes has strengthened even more. I lovelovelove the 2011 Winter Holidays collections from OPI, China Glaze and Essie. 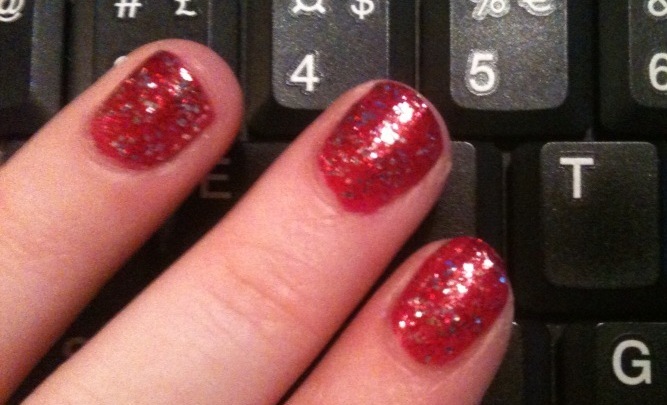 Never being a fan of glitter nail polishes, I found myself not surviving without buying one (or couple!). Combination of fine red glitter and rounded silver glitter particles, absolutely gorgeous! applied two layers of Love Marilyn on top. I know some ladies are trying to avoid glitters because its a headache to remove them. Check out this helpful tutorial from MissChevious, one of my favorite YouTube Makeup Gurus. method to remove glitter polish from your nails. So, give Glitters a try! Stay tuned for the Episode #2! According to Wiki, Old New Year or the Orthodox New Year is an informal traditional holiday, celebrated on as the start of the New Year according to the Julian calendar. Nowadays, on the Gregorian calendar, the Orthodox New Year falls on 14th day which is today. Actually, the word "informal" is pretty descriptive. On the 13th January's Eve we usually have a family dinner - enjoying our meal and a glass of wine. Old New Year is about "warm and cosy feeling of home". Especially with the winter blizzard raging outside. Ouch! 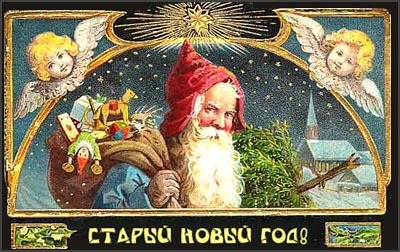 As we say "Happy Old New Year" or "Со Старым Новым Годом!"